Time is precious! Spending time with family, making memories and enjoying each other's company is what it's all about! So, why not free up more time for family by spending less time in travel? The TomTom VIA offers up impressive technology (hello, TomTom live traffic updates, you are my new best friend) in a sleek design; providing the peace of mind you need, while also freeing up more time for fun. Boasting a large 6" touchscreen display, lifetime maps and traffic updates, advance lane guidance, and easily navigated menu options (including 7 million pre-loaded points of interest), the TomTom VIA 1605 is an absolute travel essential. City dwellers,TomTom's advance lane guidance is incredible! This feature gives you advance warning on which lane you need to be in AND includes a visual aid of the road with arrows directing you to the correct lane; never miss your turn again. Just think of all of that extra time you will have on your hands! TomTom really takes the guesswork out of traveling. The TomTom VIA 1605 is the perfect travel companion. Whether you use the TomTom VIA 1605 to avoid daily traffic when traveling to and from work or for a long distance road trip, one thing's for certain -- you'll never want to leave home without it! Check out my hands on video review of the TomTom VIA 1605. 6" Touch Screen: See your next instruction better on our biggest and sharpest screen yet. With bigger menus and buttons on the extra-large 6" screen, navigation is safe and easy. 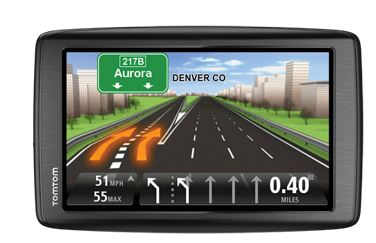 Lifetime Traffic & Map Updates: Enjoy a lifetime of easy driving with two great features from TomTom. Lifetime Map Updates guarantees you receive four new editions of your TomTom map each year to ensure that you are always navigating with the industry’s most up-to-date map. And, Lifetime Traffic Updates automatically sends real-time updates to your TomTom, so you can steer clear of traffic delays and take the fastest route possible to your destination. *Applies to maps of US, Canada & Mexico only. You receive non-transferable traffic data and up to four non-transferable map data updates per year until the product’s useful life expires or TomTom no longer receives map or traffic updates from its suppliers, whichever is shorter. Details and terms at www.tomtom.com/legal. Lifetime Traffic updates are available in the US and Canada only. Never miss your exit with Advanced Lane Guidance: TomTom provides extra clarity when navigating difficult junctions by showing you which lane to take, so you won’t miss your turn or have to make dangerous lane crossings. Photorealistic images and a pulsing green arrow indicate exactly which lane to use. *Feature available in the US & Canada only. I'm excited about the large screen! I like the idea of Advanced Lane Guidance. I am paranoid about being in the wrong lane. Thanks for the chance to win! I like the Advanced Lane Guidance. I like the lifetime updates. Thanks! I like the Advanced Lane Guidance. I could have used this in the city 2 weeks ago. My current GPS tells me to turn 15 seconds before I need to, which isn't always possible in city driving. I am most excited about the Advanced Lane Guidance. That its easy to use and traffic updates! I am most excited about the lifetime traffic and map updates. The 6" touch screen. At my old age...I need to see things as big as I can! I like the Lifetime Traffic & Map Updates! I like the fact that it has a large 6 inch screen. Love the 6" screen and the lifetime maps and traffic updates! I like both the 6" screen and the Lifetime Traffic & Map Updates! Hello, I most excited about the real-time updates, anything that helps to avoid a traffic jam is high on my list. Thanks for a great giveaway! I like the advanced lane guidance! I like the lifetime maps and traffic updates! Touch screen and Advanced Lane Guidance!!! I love that the screen is larger! Lifetime traffic and map updates. I love the lane guidance feature. I always seem to be in the wrong lane at the wrong time. Thanks for the giveaway! The real time traffic updates would really help me on my hour commute in the morning!! I like the map updates.